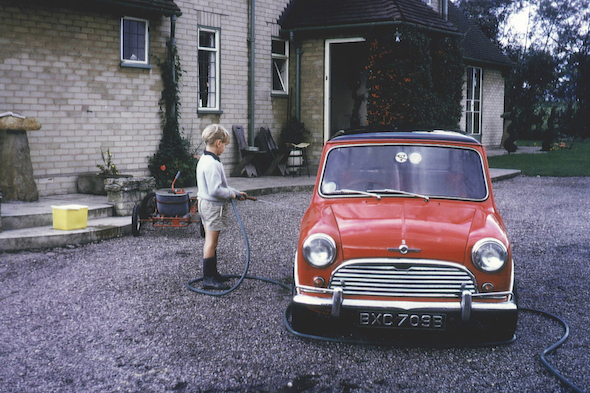 Do you look back on your first car with a sense of fondness, or disgust? If you would say the former then you're not alone. A study, carried out by Direct Line, has found that more than one in three Britons (37 per cent) claim to have 'fallen in love' with their first car, regardless of its condition. The study, conducted online by Opinium Research, found that, while 25 per cent of those surveyed loved their first car more than any other subsequent vehicle, only 13 per cent had given their first car a name, with women proving twice as likely to name their first cars. The study also researched what cars were most popular amongst first time drivers. The list features vehicles spanning a number of decades, from the Austin Metro to the ever-desirable British Mini Cooper, which took the top spot. Of the 1,298 people surveyed, motorists were found to keep their first car for two years and two months. Two-in-five (41 per cent) of participants said that their first car made them feel "cool", while three quarters (74 per cent) claimed that the freedom their first car gave them changed their life. Another figure revealed included the vast difference between the amounts of money that 18-34 year olds paid to get on the road, compared to those over 55. The younger group paid on average £2,274 for their first motor, while those who passed their test a while ago paid only £699.